Cathal McCarron will start at corner back. 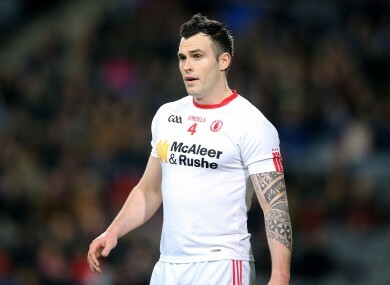 TYRONE HAVE NAMED just seven of the team that controversially beat Monaghan in the All-Ireland football championship quarter-finals two years ago as the pair get set to meet again at the same stage in Croke Park this Saturday. However, Micky Harte has made just one change from the side which easily dispatched of Sligo in the final round of the Qualifiers, Cathal McCarron returning at corner back in place of Trillick’s Rory Brennan. Tyrone will be once again captained by Sean Cavanagh, set to make his 78th championship appearance for the Red Hands. Monaghan, meanwhile, have decided to stick with the same starting XV that secured the county’s second Ulster title in three seasons last month with the inclusion of Christopher McGuinness the only change in the 26. Email “Monaghan stick with tried and trusted but one change for Tyrone”. Feedback on “Monaghan stick with tried and trusted but one change for Tyrone”.